A councillor is pushing for answers on the future of a town centre doctor’s surgery, amid concerns it will move further from its patients. Bognor Health Centre sits within the area due to be redeveloped as part of regeneration plans but it is still not clear whether the facility will be relocated. District councillor Paul Wells said he ‘didn’t think for one moment’ the surgery would be lost entirely but he was anxious it should remain in the town centre. He said: “The surgery is a fundamental part of the community in Bognor Regis, it’s a critical service that’s provided to the community through the NHS especially to these patients it serves. 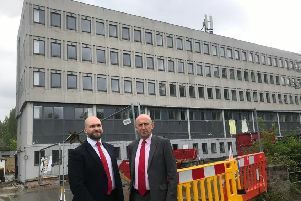 He said the district council intended to include the surgery, which overlooks the Hothampton site, in its plans for redevelopment of the area as a whole. But the health authority has yet to give a statement on if it will consider an alternative site or whether the existing health centre could be rebuilt. Cllr Wells said he wanted a ‘straight answer’ for residents and the users of the surgery, which he estimated served around 10,000 patients. “As the health centre in Bognor Regis is serves a large swathe of the community in the centre of the town,” he said. He added that the surgery also had the effect of bringing people into the town centre from the periphery of Bognor Regis. The relevant health authority, Coastal West Sussex Clinical Commissioning Group has been approached for comment.